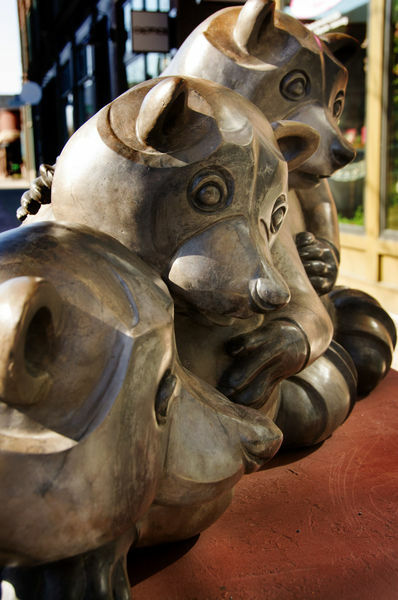 Sioux Falls, SD – October 15, 2018 – The annual SculptureWalk People’s Choice award goes to Bear Lee, Standing created by Ohio artist, Gary Hovey, as selected by visitors to annual public art exhibition of sculptures in historic Downtown Sioux Falls. 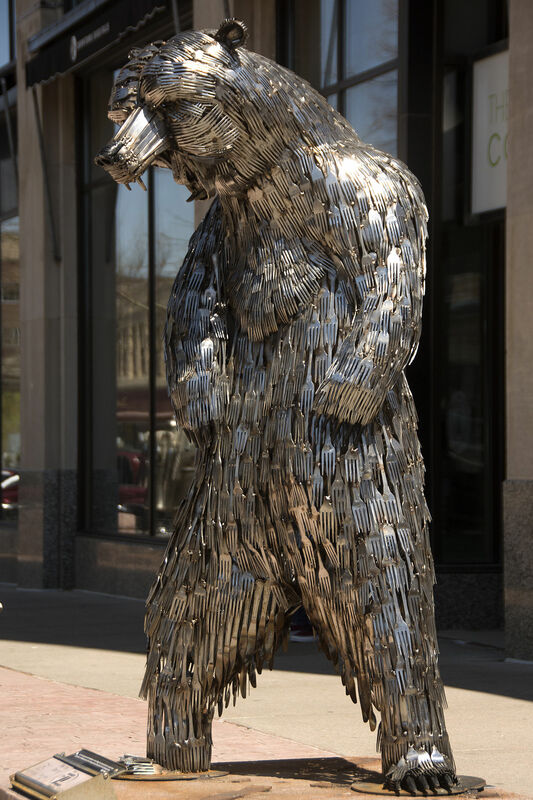 The grizzly bear sculpture is crafted out of stainless-steel dinner forks and knives. 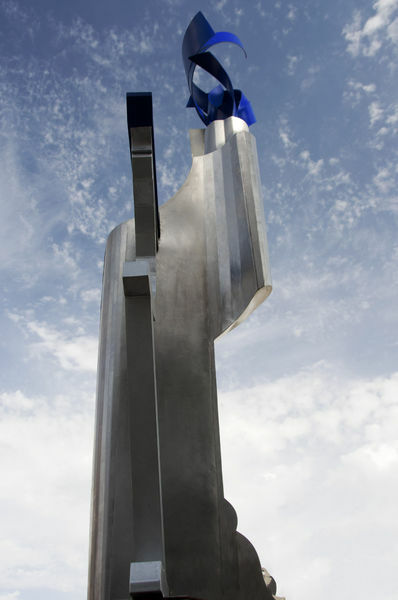 Standing six feet tall, the unique sculpture captured the most votes in the 15th annual SculptureWalk balloting. 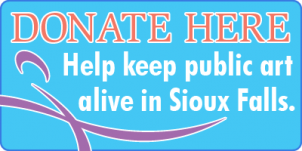 Not to mention 1000’s of selfies with visitors to the corner of 11th & Phillips Avenue in Historic Downtown Sioux Falls. 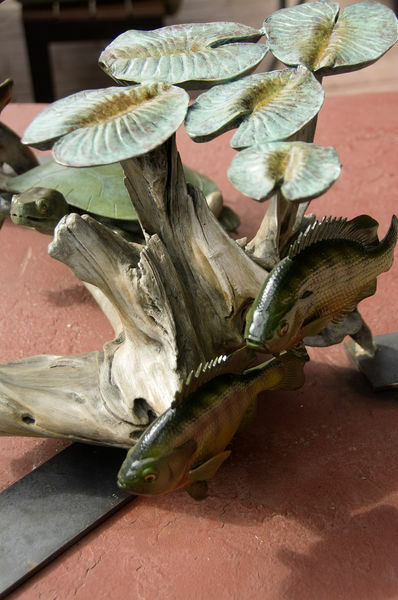 Unknown to most people, Hovey’s creativity, attention to intricate detail and skills are a testament to his courage in fighting through Parkinson’s disease. 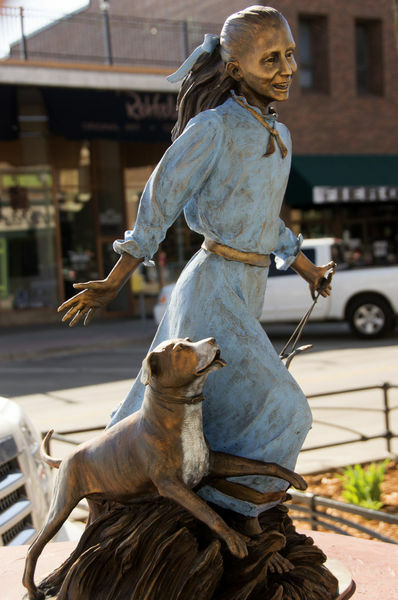 Hovey had two sculptures juried into the 15th annual SculptureWalk exhibit that also included his piece Girlilla & Tiney exhibited in front of the Phillips Avenue Diner. SculptureWalk 15th Anniversary Virtuoso Best of Show winners were announced today representing the best-of-the-best sculptures as judged on artistic merit and creativity by SculptureWalk sculptors. 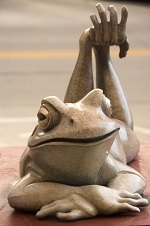 The top sculpture is “Red Legged Frog” by nationally recognized artist, Pokey Park, of Tucson Arizona. 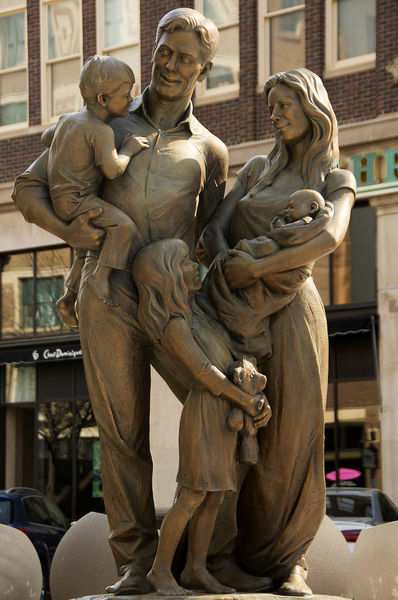 The winning artists receive a cash award made possible by a gift from the Scoular Family Trust and become eligible to be named a Virtuoso Sculptor. 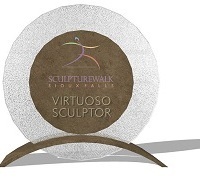 *Ben Hammond has achieved SculptureWalk Virtuoso Sculptor Certification and will now be recognized as a Virtuoso Sculptor. To enhance the experience of visitors and patrons, SculptureWalk, First Bank & Trust and the Washington Pavilion have partnered together to create a SculptureWalk Visitor Center. The new center is located inside the Washington Pavilion and features a large-scale map of the sculpture route, brochures, video, artwork and more. 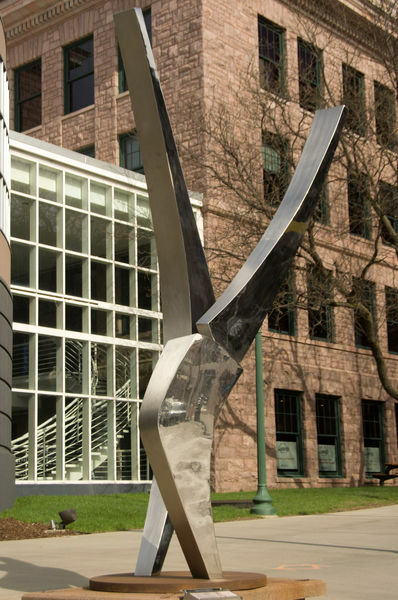 The space is located on the second floor of the Washington Pavilion just outside the entrance to the Visual Arts Center, the new SculptureWalk Visitor Center is a great place to either start or finish your tour of the sculptures in Downtown Sioux Falls. 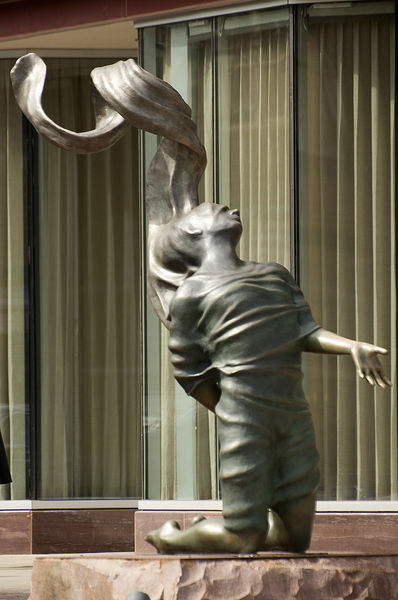 The SculptureWalk Visitor Center is open whenever the Washington Pavilion is open to the public. Learn more here. 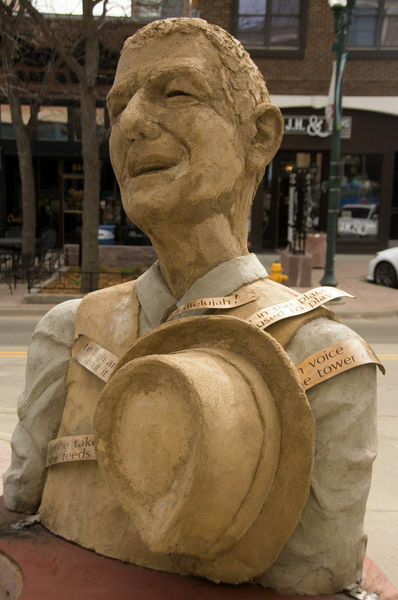 The 15th Annual SculptureWalk has been installed in Downtown Sioux Falls! 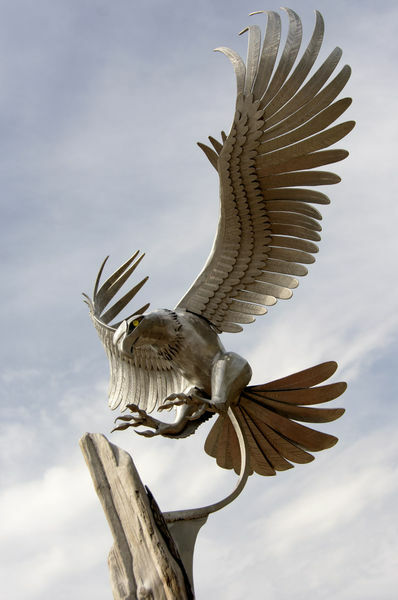 Started in 2004, SculptureWalk is the largest and most recognized annual exhibit of public art sculptures in the country.